Scoped out handbags at the mall today. Unfortunately I wandered a little too close to the perfume counter and was literally accosted by two "Sprayers". Well they didn't actually spray me - I don't think they do that any more - but they did both shove little white perfume strips in my face, Calvin Klein Euphoria and Burberry London for Women...pretty bottles aside, in my opinion they were both just "meh". Official product description: a soft, fruity floral that sparkles with notes of mandarin, blackcurrant, violet, and blackberry, smoothed with jasmine, heliotrope, and cedarwood. Playful, yet elegant. Notes include Mandarin, Bitter Orange, Blackcurrant, Violet, Blackberry, Jasmine, Heliotrope, Cedarwood. 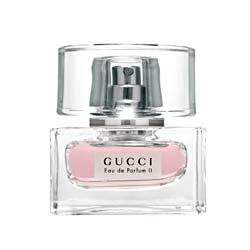 My first Gucci bottle was a surprise gift from my Sweety on one of his trips home. I'm on my 4th bottle now and I don't plan on switching to a new fragrance any time soon... unless of course he happens to give me a bottle of Vera Wang Princess on his next trip back (hint, hint, wink, wink). Technically, I should change this entry title to "When in Paris... Do as the Parisians Do". Yup, I'm off to Gay Paree in a month! Not wanting to stand out as a tourist (Oh quelle horreur! ), I've diligently studied my spring fashion mags and learned that the IN things for Paris this Spring are ballerines - aka ballet flats and skinny jeans (Oh quelle horreur!). Where should I start on how WRONG this is on so many levels. Flats and skinny jeans on a chic who's five foot two (and a half!)... wrong, just wrong. Atrocious thoughts aside and being the superficial, narcissistic, shallow person that I am - I've finally succumbed and purchased the cutest black patent ballet flats at DSW, on sale for $28 bucks. They still make me look short, but surpisingly, they don't make my feet look fat. In fact, it even shows a little bit of toe cleavage! This page contains all entries posted to veronicafung.com in April 2007. They are listed from oldest to newest.